Ultra Right MFE Off Our Streets! 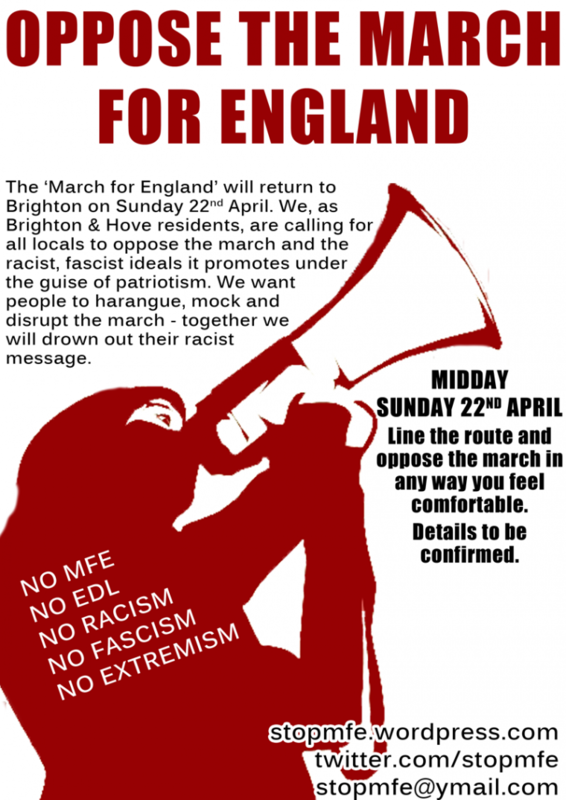 At 11.30am on Sunday 22nd April March for England, the English Defence League, Casuals United and other far right groups will gather at Brighton Station with the intention to march through our town. Far from being an innocent celebration of traditional culture this event will be used as a cover to bring their hate filled politics into the centre of Brighton. We have called for those who want to put forward an alternative view to line Queens Rd, from the station to the clock tower, from 11am. Together we will drown out their message of hate. Stop MFE! Please note new start time, get there around 11am innit!